Clyde Peeling's Reptiland - Allenwood, PA has been entertaining people of all ages for more than 50 years. Although it is widely known for creatures that slither and scamper, the zoo offers much more than reptiles. In addition to seasonal butterfly and dinosaur exhibits, Reptiland is introducing Choose Your Adventure: an all-new lineup of live shows, up-close animal encounters, and special events. Visitors can enjoy several live shows throughout the day, including more intimate keeper talks that feature the Komodo dragon and American alligator. New shows The Ruling Reptiles and Lizards & Snakes Alive introduce visitors to reptiles past and present, while the popular show Venom! explores the fascinating topic of animal toxins. Meet and Feed the Gentle Giants is a new premium experience that lets guests touch, feed, and have their picture taken with Aldabra tortoises Al and Henry. As Reptiland favorites, guests love to visit with these two, and now they can get to know them one-on-one. Open through September 7, Ghost of the Bayou is a special exhibit starring the rare white alligator. There are two types of white alligator, and the one currently at Reptiland is albino. His skin is whitish-ivory and his eyes pink due to the absence of the pigment melanin. White alligators are very rare, especially in the wild. According to Cajun legend, it is believed that those who look into the eyes of these mysterious creatures will be blessed with good fortune; whether or not that’s true is for zoo goers to decide! Operations Manager Chad Peeling explains, “This summer is all about new experiences for our guests—and after over 50 years in business, it’s exciting that Reptiland is always changing.” Reptiland is also hosting two events this summer. Dino Days, a whole weekend dedicated to dinosaurs, will be held on June 27 and 28. Dr. Dino, an paleontologist from the Brevard Zoo, will be in attendance to show off his extensive fossil collection and take visitors on a dinosaur hunt. Guests can walk among creatures that roar, spit, and bellow in Dinosaurs Come to Life, make a fossil rubbing to take home as a souvenir, enter to win a Prehistoric Prize Package, and more—all included in the price of general admission. 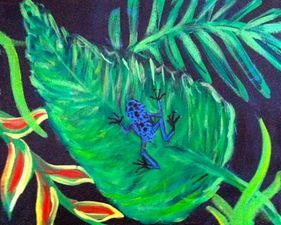 On July 11, Reptiland will celebrate its 51st anniversary with Wine and Design: Paint for Conservation, a fundraiser benefitting amphibians. Frogs are disappearing at an alarming rate, and this event will help raise awareness and funds for these endangered animals. Williamsport Wine and Design partnered with Reptiland for this event and created an exclusive scene for attendees to paint. The event will also include live music by Blue River Spell, food and wine by the Genetti, zoo exhibits by torchlight, and animal feedings & encounters. Tickets are now on sale and can be purchased in person or by calling 570-538-1869. For more information on Reptiland’s exhibits, shows, and events, visit reptiland.com. Clyde Peeling’s Reptiland is a world-class specialized zoo accredited by the Association of Zoos & Aquariums. Open year-round, Reptiland introduces visitors to the less-loved members of the animal kingdom.